There, you'll find information about my custom jewelry creations, tarot reading services (I've been studying and reading tarot since 2001), wedding officiating, and selected research and consulting services. I love making jewelry, but over the last few years, I have less time overall to plan, create, photograph, upload, and sell online unless I'm preparing for a specific event. But, in the meantime, I've been enjoying dreaming up and creating custom pieces for clients. If you're in the Durham/Raleigh/Chapel Hill/Carrboro area, I'll be selling jewelry and reading tarot on July 15, 2017 at the July Outdoor Market from 12-5pm at 123 E. Martin St. in Raleigh, NC. I won't be updating this blog anymore, but I'll keep it alive as a visual archive of the jewelry I've created from 2011-2016. Many of the designs you find here are one of a kind or limited edition, but it may be possible for me to create you something similar to what you see. Or, let me design something just for you! Send me a message via this form. 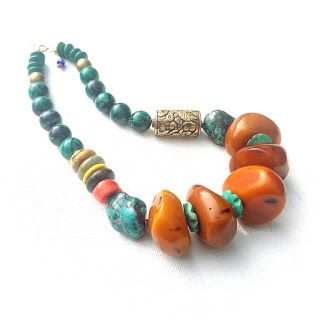 A custom, one-of-a-kind piece for a friend and client featuring jasper, turquoise, Nepalese resin, and Tibetan artisan brass.